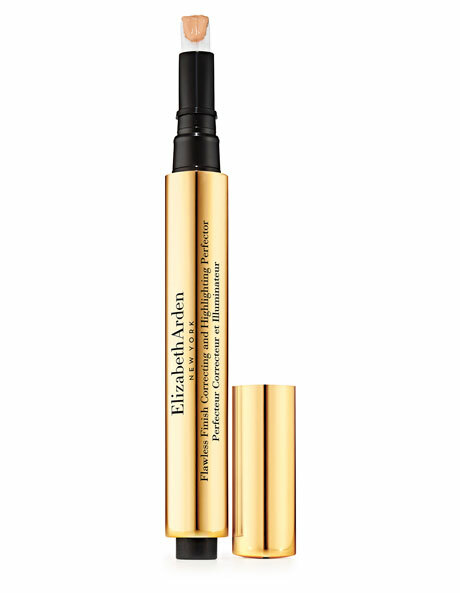 This luxuriously lightweight concealer pen is an instant pick-me-up that immediately erases signs of fatigue and restores skin to a radiant and rested glow. With one sweep, Flawless Finish Correcting and Highlighting Perfector masks imperfections from dark circles and shadows to fine lines, blemishes and redness. The buildable, light-to-medium coverage formula is rich with hydrators, environmental protectants and reflective pigments that help correct problematic areas and highlight the contours of the face. The easily blendable formula works with all skin types and is suitable for the delicate skin around the eyes. Wu Zhu Yu Plant: A natural plant derivative that helps enhance brightness, radiance and luminosity of the skin. Moisturizers & Emollients: Immediately moisturizes skin and offers a flexible barrier to help protect against environmental stressors. Soft Focus Microspheres: A blend of spherical technology ingredients that help blur imperfections and minimize the appearance of fine lines and wrinkles for a radiant and luminous finish. Mica: A pearlized mineral that illuminates and brightens the skin. Vitamin E: A powerful environmental protectant that moisturizes and helps protect the skin from environmental stressors that can cause visible signs of aging.